Get squinting, this post is rather bright..
Today has been a wee bit exciting, today was the day of the MORE Magazine shoot which I had tried to keep quiet to myself for the past couple of weeks! I will do a most explaining more and what I wore soonies! But I will be featured in an April issue! So keep yo eyelids peeled!! For the time being, here be an outfit post I've been waiting to release for about a week now! Pretty much just a black & neon outfit which I feel works a lot better than I thought it would had. Wearing my new chiffon oversized shirt from American Apparel which George kindly bought me as one of my birthday presents!! Couldn't appreciate it enough since it was pretty pricey for just a shirt! 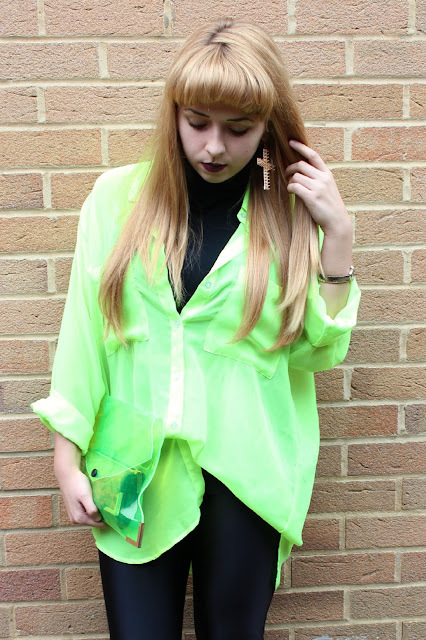 I'm still in a neon phase at the moment and these two pieces together just have my name all over it! & yes, my vagabonds. Still madly in love with these pair of yummies, have worn them continius for the past 10-14 days now! Sensational comfort for the tootsies! For some reason, my camera doesn't seem to capture the shirt very well which makes it look overly bright and not show the real colour of it which is annoying! The pictures only get brighter..
but about a year ago now I saw these ones in Topshop and really regretted not getting them, so a few months ago saw these ones (as seen below) on eBay which looked the exact same! And for half the price I thought I best buy them, as a 'just in case' jewelry item. They are a super huge earring! With raised spikes too which really drew me to them. The size was so overpowering, I decided not to wear a necklace with it since it looked a bit too busy! Hope you liked this weeks look! but you will have to see the final outcome in April! - Look out for me. Its mid week people, nearly the weekend! Finally a weekend I'm super looking forward to! No work all weekend, and out for friends birthday celebrations!! Have a gooden! love the blouse! green definitely suits you! can't wait to see the more feature! Love that the clutch and shirt match! you look awesome! 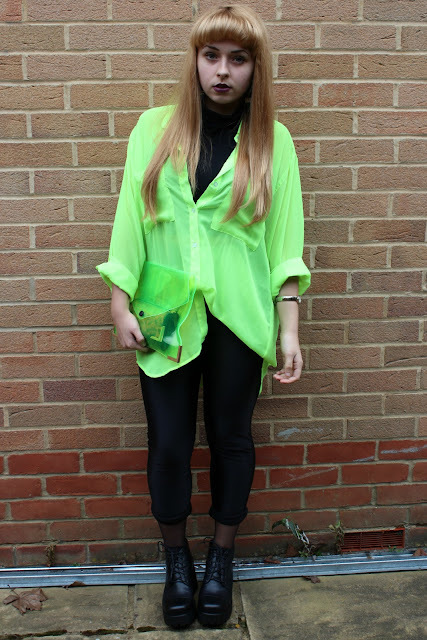 love the neon blouse with the neon perspex clutch and those boots, WOWSERS! 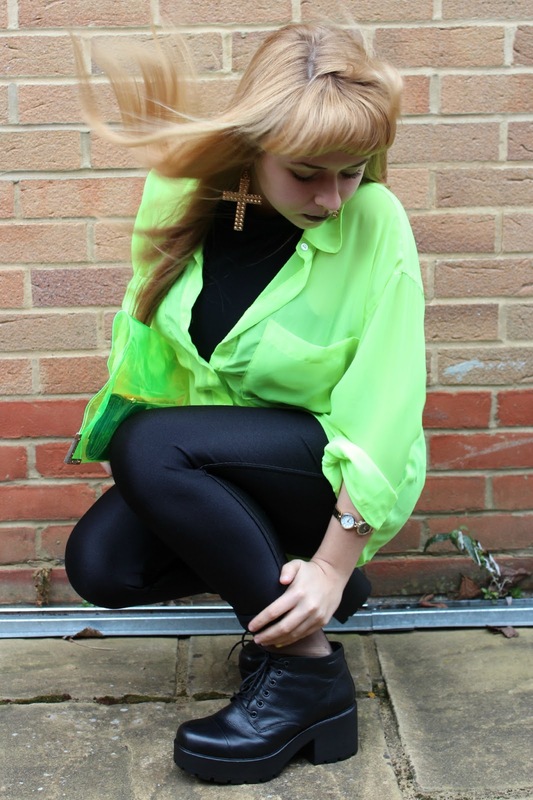 Love this look on you, the shirt is AMAZING and looks so nice with the black leggings and shoes!